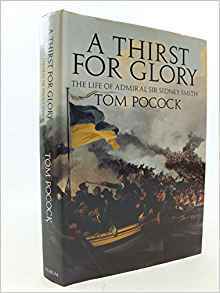 Tom Pocock's biography of Sir Sidney Smith or the Swedish Knight as he was known following his service in the Swedish navy in their war against Russia. The latest addition to the bookshelves helps to round out the Mediterranean section of my library and is by one of my favourite authors. Sir Sidney Smith was never accorded the celebrity status and reverence enjoyed by Nelson and indeed, always seemed to be in his shadow but his contribution to Great Britain's war against Napoleon was invaluable. In later years Napoleon himself said that Smith "made him miss his destiny" following the unsuccessful siege of Acre at which Smith commanded. Smith had the uncanny knack of offending his superiors and of 'rocking the establishment boat' so to speak and so was only reluctantly given credit and recognition for his efforts. This was a continual distraction for him and unfortunately he was not afraid to voice his opinions and feelings on the matter - which further alienated his superiors and the government. There is a lot of scope for smaller actions in the Mediterranean during the Napoleonic Wars - both from the naval and land side and so this book will be very useful as Sidney Smith certainly had a very varied career in the area. A Thirst For Glory complements Pocock's Stopping Napoleon: War and Intrigue in the Mediterranean as well as Remember Nelson, his biography of Captain Sir William Hoste. I should also include his biography of nelson as well and I am happy to say I have all of these in the library!